Editor’s Note: This week we’re at the 229th AAS Meeting in Grapevine, TX. Along with a team of authors from astrobites.com, I will be writing updates on selected events at the meeting and posting each day. Follow along here or at astrobites.com, or catch our live-tweeted updates from the @astrobites Twitter account. The usual posting schedule for AAS Nova will resume next week. Dr. Terry Forbes (University of New Hampshire) is a theorist working to understand solar flares like the one shown above from the Solar Dynamics Observatory. All of these eruptions arise from instabilities of stressed magnetic fields on the surface of the Sun. New theories must address the light curves of solar flares. In the chromosphere, H-alpha observations of flare “ribbons” demonstrate that these ribbon arise in minutes, then decay over many hours. In the corona, hard X-rays (above ~1 keV) will last less than an hour, but soft X-rays (<1 keV) can persist for a few hours. These timescales are clues to the physical processes at work in solar flares. Magnetic reconnection is the physical process that seems to explain much of this solar activity. Dr. Forbes has spent most of his career working on the details of magnetic reconnection and using observations to inform the theory. As examples, he showed videos showing how flares grow over 4–5 hours and showing how the relatively hotter and cooler material moves relative to each other. While the theory has improved significantly over the last few years, there are a few still unanswered questions. Understanding exactly how large the reconnection regions are and searching more thoroughly for slowly propagating shocks are the next discoveries that can push forward our understanding of magnetic activity on the Sun. The first press conference of the day covered four speakers on topics related to stars and interstellar space. First up was Julia Zachary (Wesleyan University), an undergraduate student who spoke about observations from Hubble and the two Voyager Spacecrafts. Combining the views of these three spacecrafts has allowed astronomers to get both a large- and small-scale view of the interstellar medium that the Voyager spacecrafts are traveling through, providing a broad look at the environment surrounding the spacecraft, as well as more information about the heliosphere that surrounds our solar system and how it adapts to its surroundings. To learn more, check out their press release here. Next up was Larry Molnar (Calvin College), who presented on two of the elements he considers to make science exciting: “a very specific prediction that can be tested, and a big explosion.” Both topics related to the fate of contact binary stars, stars that are so close to each other that they share a common atmosphere. Molnar and his team’s observations of the binary star system KIC 9832227 have convinced them that the system will merge and explode around the year 2022, temporarily becoming one of the brightest stars in the night sky. 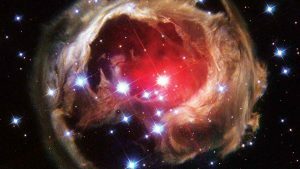 This explosion, known as a red nova, will provide great insight into the deaths of binary stars. More info can be found in their press release. The third talk was given by Walid Majid (Jet Propulsion Laboratory). Majid spoke on PSR J1119-6127, the “missing link” neutron star. PSR J1119-6127 has been caught behaving both like a radio pulsar and like a magnetar, suggesting that it may be in a never-before-seen transition period between the two states. Pulsars and magnetars have long been believed to be connected, so the discovery of an object that exhibits part-time behavior of both is an important find. Scientists currently believe that the magnetar-like X-ray bursts it exhibited in 2016 (after having behaved very politely like a quiet radio pulsar since 2000) were due to its large magnetic field becoming twisted as the object spun. You can find out more in the press release here. Finally, Lori Allen (National Optical Astronomy Observatory) concluded the session with a discussion about light-pollution solutions that communities can use. In particular, Allen addressed the issue of outdoor LEDs, which have become an increasing problem as LEDs take over as the dominant source of outdoor lighting. Allen identified several ways to battle light pollution from LED lighting: shielding (point lights downward rather than at the sky), brightness (choose dimmer options when possible), and color (options that are less blue are less disruptive to astronomy, wildlife, etc.). More info is available here. Karin Öberg (Harvard-Smithsonian CfA) gave an excellent prize talk about the many facets of how planets form. Stars with disks are an interesting phase of star and planet formation, and varying chemistry in protoplanetary disks has a big effect on what kind of planets can form. Öberg said that it’s all well and good if we know a planet is in the “habitable zone,” but if it doesn’t have the right material for liquid water, it’s not going to be Earth-like. Her work is possible now thanks to the Atacama Large Millimeter/submillimeter Array (ALMA)’s unprecedented view of planet-forming disks of gas and dust swirling around stars. One piece of the protoplanetary disk puzzle is measuring the location of snowlines, or transitional regions where certain molecules freeze out. Different physical processes govern planet formation on either side of a snowline. Knowing the temperature profile of a protoplanetary disk isn’t enough information on its own, however, because chemical composition and particle size also affect where snowlines fall. Therefore, Öberg uses laboratory experiments to figure out which observable molecules trace the positions of carbon monoxide (CO) and other volatile ices and find snowlines. In the past, our own Solar System formed from a protoplanetary disk much like the ones Öberg studies. It turns out the same molecules that can form ices around protostars are also important in comets! She finds that the kinds of molecules in protoplanetary disks are also present in comets in our own Solar System, and can use deuterated molecules (those that have hydrogen atoms with an extra neutron) to compare planet formation histories. Overall, water is always abundant during planet formation. Other volatile molecules probably arrive with water, but chemistry and turbulence in protoplanetary disks may alter or destroy them. Öberg’s doesn’t think the chemistry of our Solar System is necessarily special, and says other systems could likely have the same chemical soup. To know for sure, though, we will need to observe more than just a handful of protoplanetary disks and do statistical studies. We also need to keep investigating astrochemistry in the laboratory: for example, how different ices clump together, and what happens when they are exposed to different kinds of light and radiation. The future of protoplanetary disks is bright. Today’s press conference on exoplanets and exocomets was started by Eden Girma, from Harvard College. She discussed her research on the possibility that black holes may eject “spitballs,” remnants from stars shredded by the black hole. Disrupted by tidal forces, these stars would become spaghettified, then ejected back into the solar system. Grima’s simulations indicate the 95% of these stellar fragments would be be ejected out of the solar system with hyper-velocities. 90% of the bound fragments would only get as far as 100 parsecs from the black hole. She also performed a calculation to determine the number of fragments within a surveying radius from the Sun, and found that the distance to the nearest fragment could be about 200 parsecs. These fragments could then perhaps be detected using JWST or via microlensing. James Vesper, from New Mexico State University, studied the possibility of how free-floating planets, or rogue planets, could interact with a solar system. He performed 156 N-body simulations of encounters of rogue planets within our Milky Way, and found that 60% of the simulations resulted in a slingshot scenario, where the rogue is captured and then slung out of the system. Other possible results are the the rogue planet is captured, then leaves the system, taking a planet with it, or that the rogue planet is captured into the solar system without disturbing the orbits of other planets. From these results, Vesper found that it is possible the proposed Planet 9 could have been captured as a free-floating planet, given its orbit. New results for direct imaging of exoplanets were given by Thayne M. Currie of Subaru Telescope and NAOJ and Tyler Groff of Princeton University. This imager uses a coronagraph and extreme adaptive optics to directly image planets orbiting closely to their host star. With this instrument, astronomers have imaged possibly the youngest debris disk ever detected. Groff described the CHARIS integral field spectrograph, which is optimized to detect planets existing extremely close to the star. Between the imager and the spectrograph, even more direct images of exoplanets are on their way. The final presentation of the press conference was given by Carol A. Grady from Eureka Scientific. She discussed the transiting exocomets of an A star called HD 172555. Using absorption spectroscopy from the Hubble Space Telescope, she found absorption features in silicon and carbon that were visible through two different sets of spectra. These absorption signatures are similar to what is expected for sun-grazing comets if they were to have enough material associated with them. For the first time, comets in other solar systems have been detected. Philip Hopkins of Caltech won this year’s Warner Prize, which is given by the AAS to a young scientist for a “significant contribution to astronomy in the five years preceding the award.” In his prize talk, Hopkins focused on a large body of work his research group has done to investigate a series of long-standing questions in astrophysics through the use of state-of-the-art numerical simulations. His basic point: that feedback — the return of energy, momentum, and mass to the interstellar and intergalactic media from stars, supernovae, and AGN — plays a hugely important role in regulating the evolution of galaxies, and it is thus crucial to model feedback as realistically as possible in simulations. Previous-generation simulations have revolutionized our understanding of the evolution of the universe, including how galaxies form and evolve. However, there remained a number of important observational results these simulations failed to address. For example, standard Lambda-CDM cosmology predicts the hierarchical assembly of galaxies over time, and thus the presence of a very large number of satellite galaxies for each large galaxy such as the Milky Way. We observe many, many fewer such dwarf galaxies in our local group than what is predicted by these simulations (this issue is known as the “missing satellites” problem). Simulations also show that dwarf galaxies all have a particular distribution of mass known as the NFW profile; actual dwarfs have much less of their mass in their centers than expected (the “core-cusp” problem). Perhaps most egregiously, the majority of cosmological simulations convert essentially all of their gas into stars, leading to factors of 10 to 100 too many stars and an equal overestimate of the star formation rate as compared to what we observe in galaxies today. One of the obvious reasons for the latter issue is that simulations attempting to model large portions of the universe over billions of years simply cannot achieve the spatial resolution to properly treat the physics of star formation, which occurs on scales of tens of parsecs and smaller. These simulations use simple prescriptions, often based on observed trends such as the Kennicutt-Schmidt relation, to simply convert some fraction of gas into stars globally in galaxies. Similar approaches are needed for treating other small-scale physics such as AGN, supernovae, and chemistry. These so-called “subgrid models” save immense amounts of computational time, but also gloss over potentially important physics. Hopkins’s FIRE simulations focus on a single galaxy evolving from the beginning of the universe to today, and by limiting the largest scale to 100s of kiloparsecs (and through improvements in computing power and algorithms), they are able to resolve scales of less than 10 parsecs — small enough to incorporate some realistic physics of star formation and feedback. The latter is particularly important: massive stars explode as supernovae at the ends of their short lives, and these energetic events inject a huge amount of energy (as well as momentum and mass) into the surrounding medium. Furthermore, star formation occurs in clusters, not uniformly throughout a galaxy disk, and thus supernovae tend to overlap rather than be distributed at random. The overlap increases the total energy input, which can at times be high enough to push bubbles and plumes beyond the galaxy’s potential well. These processes act to limit a galaxy’s ability to form stars, as the injected energy opposes gravity’s inward force, disrupts the molecular clouds from making more stars, and in the case of supernova overlap can even strip gas from galaxies entirely. As a result, star formation is self-regulated: gas collects under gravity, stars form, supernovae explode, and then gas that may have been able to form stars no longer can. Including this feedback realistically in simulations mostly resolves the huge discrepancy between the predicted and observed star formation rates. Hopkins showed that feedback also resolves the missing satellites and cusp-core issues. Since dwarf galaxies are much less massive than Milky Way-type galaxies, their gravitational potentials are much shallower. Supernovae and feedback processes from AGN are thus very effective at unbinding stars (and gas) from dwarf galaxies. This can lead to either their disruption (meaning there end up being fewer dwarfs than otherwise expected, solving the missing satellites problem), or the pushing of mass towards the outskirts of galaxies, solving the cusp-core problem. The resolution of these long-standing discrepancies between predictions of standard cosmology and observations is evidence that Lambda-CDM — with the physics of feedback included — does a really good job of explaining how galaxies evolve over cosmic time. Naturally, there are still many open questions, including the details of how feedback from AGN couples to the much, much larger scales it seems to affect, the role of magnetic fields, the nature of dark matter, and the growth of supermassive black holes. As simulations become more sophisticated and realistic, and simulators continue to innovate, perhaps these issues will soon be able to be directly addressed as well. Earth’s atmosphere is a burden to astronomers. Even for the radiation that can penetrate through the atmosphere at all, we still have to worry about absorption and scattering. This is alleviated by building observatories at high altitudes and in dry climates. If you have really deep pockets, you could fund a space-based telescope mission, though these cost hundreds of millions to billions of dollars. Aircraft-based telescopes like Sofia can get above 90% of the atmosphere, but still cost over $300 million. However, there is a cheap and effective means to overcome the atmosphere—strap your telescope to a high altitude balloon! Modern balloon-borne projects can get above 99.5% of the atmosphere for a fraction of the cost. This means effective scientific endeavors cost only about $10 million! Furthermore, the cheapest high-altitude balloons can cost as little as $100 per launch, providing a great opportunity for young students to test the scientific waters. Laura Fissel of NRAO spent the last plenary of the day discussing such projects in astronomy, and some of the great science that has come out of these balloon-borne projects. The balloons used for these kinds of experiments have the consistency and thickness of a typical sandwich bag, but can lift payloads of 6000 pounds over 40 kilometers into the atmosphere. Like a balloon in a vacuum chamber, the incredibly low atmospheric pressure at these altitudes causes them to grow to the size of an entire football stadium! Antarctica is one of the best places to launch these balloons and do observations because the wind patterns allow it to circumnavigate the pole and can stay in the sky for up to 2 months. Fissel worked with a project called BLAST (Balloon-borne Large-Aperture Sub-millimeter Telescope), a 1.8-meter telescope that had the ability to study galactic dust and star formation. The first flight took place in Antarctica in 2006. After completing its science and detaching from the balloon, the payload parachuted back to the ice below. However, once it reached the ground, the parachute failed to detach and the winds of Antarctica took the payload paraskiing across the ice for 200 kilometers, ending its long journey in an inaccessible crevasse. 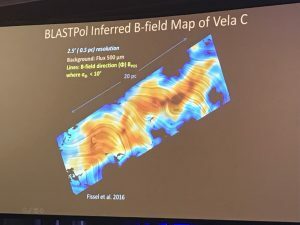 However, Fissel commented that this “could have been disastrous, but was actually the most successful BLAST flight.” Many components shook off during the telescope’s 200-kilometer journey, including all the data! In the end, BLAST made strides in understanding the contribution of high-redshift galaxies to the cosmic infrared background. After recovering the retrievable pieces from Antarctica, Fissel and the BLAST team rebuilt the apparatus and attached a polarimeter to create the revamped BLAST-Pol. This mission, which targeted the Vela C Giant Molecular Cloud, launched in 2012 and provided an unmatched analysis of magnetic fields in molecular clouds. BLAST-Pol observed polarized light, which results from aligned dust grains due to the presence of magnetic fields. These magnetic fields can play a vital role in star formation because they act against turbulence to inhibit the formation of new stars. Fissel then looked towards the future of balloon-borne astronomy with BLAST-TNG (BLAST-The Next Generation, hats off to the Star Trek reference), which will have six times the resolution of the previous BLAST experiment. Clearly, balloon-borne experiments have much more science on the way! Magnetic field structure of the Vela molecular cloud from BLAST-Pol polarization measurements. 7 January 2019 AAS News 2 AAS 233: Welcome!